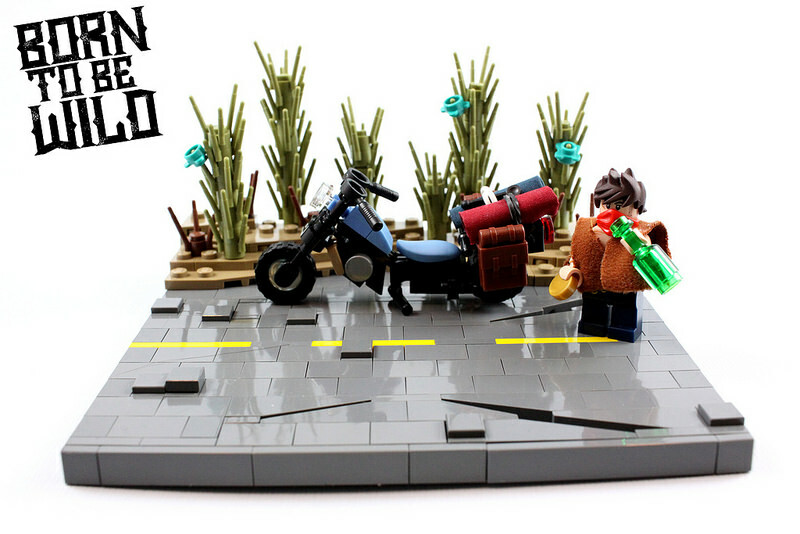 This fantastic minifig-scale LEGO motorcycle was built for a contest for the German LUG ‘Imperium der Steine’. The task was to build a motor vehicle from a movie or TV show. Ben Tritschler chose the John Travolta movie Wild Hogs (or as it’s known in Germany, Born to be Wild ) This bike is very reminiscent of the motorcycles used in the film, provided by Harley-Davidson. Simple techniques have been used to create the uneven and cracked road with fantastic effect, the flowering cacti dotting the desert drive look great. But by far, though, the best part usage goes to the Shark Guy’s arm as the bike seat.